Note that it features Pan! You've probably read The Wind in the Willows already, and if you haven't, you are seriously missing out. It's my choice this week for WTFSIRF for a couple of reasons. One, I love it. Yes, all the characters except the jailer's daughter are male; yes, it's essentially about the moneyed gentry of the Thames Valley and has some rather uncomfortable references to those poorer and less fortunate, complete with awkward lower-class accents and touching of caps; yes, it's another book written by a straight white dude. I'm sorry. 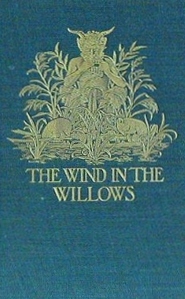 It's just that Wind in the Willows is a book from my childhood that articulates a very particular and special feeling of comfort that has nothing to do with social roles or gender and everything to do with the feeling of being a small animal in a snug, beautiful hole - just like my favorite thing about the entire Lord of the Rings cycle is not the adventure but the hobbit-holes. Yes, I'll say it right now: the thing I love best in all of Tolkien is hobbit houses. And this is especially relevant this week, because this week's WTFSIRF is a little different. See, while you're reading this, I am en route to an unconnected building site in Northern California where I will be spending nine days learning, in essence, how to make a hobbit house. 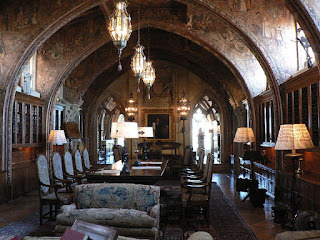 The library at Heart Castle. I mean, right? Totally like Toad Hall. I've been interested in architecture since I was a wee little thing. I'm not sure at what point I decided I wanted to be the next Julia Morgan, but I was probably about nine or ten, because I can clearly remember reading the first book I ever got on her on the floor of my dad's house shortly after my parents divorced. It was a huge, beautiful book, full of huge, beautiful pictures of buildings that looked, in retrospect, probably not unlike Kenneth Grahame imagined Toad Hall. (If you were unaware, she is the architect of William Randolph Heart's magnificent castle at San Simeon.) Imagine my chagrin when I discovered I'd have to go to at least six year of college to get my degree, and that I totally would not be allowed to start designing castles right away at all - I'd be stuck drawing stupid apartment buildings for years and years. So I scrapped that idea. Fast forward, oh, about thirteen years. (This brings us to sometime in 2010 or 11, just so you know. I'm still just a wee little thing.) My mother sends me an email asking if I've heard about Simon Dale's hobbit house. This kind of building is accessible to anyone. My main relevant skills were being able bodied, having self belief and perseverence and a mate or two to give a lift now and again. I took one look at it and thought, I want. I've written about low-impact housing and natural building on this blog before. I don't know if I've written about how it relates to certain extremely important books in my childhood - both Tolkien's works and The Wind in the Willows among them. The hobbit-houses Tolkien invented and Mole's hole as written by Grahame share something rather special - the idea of having a really snug, beautiful house that is not at odds with the natural landscape, but rather a part of it. It's also the reason I love the rather twee and sentimental Brambly Hedge books, in which a bunch of mice live happily in a quaint, idyllic, pastoral British landscape and nobody ever gets eaten by an owl: they all live in marvelous mansions inside trees, or little nests woven of grass, and it's all snug and magical and nothing gets bulldozed. I suspect this vision of life is somewhat uniquely British, or possibly even just English, and smacks rather of little girls in pinafores, cucumber sandwiches and fingerless lace gloves. (Winnie the Pooh has it too, of course.) I confess that it is somewhat embarrassingly escapist, bland, and possibly saccharine. It is certainly extremely unhip of me. But it's not the nicey-niceness of the lickle animal fwiends that I like. It's not the whimsical stories I care about. It's the deep-down longing to live with my windows in the roots of a tree overlooking a stream, to feel the earth comforting and warm about me, to be part of the landscape instead of a great bloody trampling imposition upon it. And no matter how adorable and sugar-sweet the stories may be in which these houses reside, half in the realm of fairytale and half in the realm of cozy English cottage (which is now, I think, becoming nearly equally mythical), there's a certain kind of - how can I say this? - paganism, maybe, a sense of connection to a spiritual life that can be found only in the natural world, which even the stiffly conventional Brits couldn't quite shake. None of the mice in Brambly Hedge ever go to church. Nor do the animals in Winnie the Pooh. 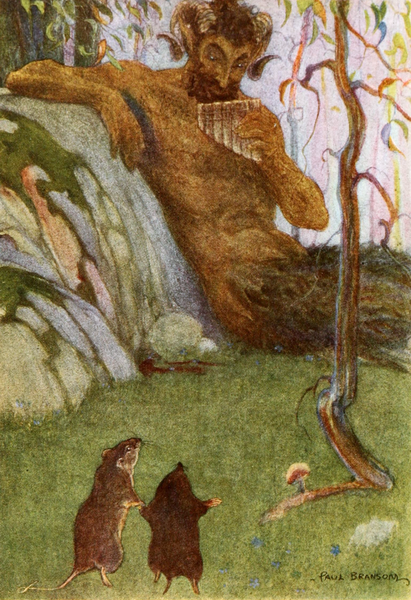 And in Wind in the Willows, there is a very lovely chapter in which Mole and Ratty have a deeply mystical experience. Then suddenly the Mole felt a great Awe fall upon him, an awe that turned his muscles to water, bowed his head, and rooted his feet to the ground. It was no panic terror— indeed he felt wonderfully at peace and happy— but it was an awe that smote and held him and, without seeing, he knew it could only mean that some august Presence was very, very near. Frontispiece from 1913 edition. See? looked in the very eyes of the Friend and Helper; saw the backward sweep of the curved horns, gleaming in the growing daylight; saw the stern, hooked nose between the kindly eyes that were looking down on them humourously, while the bearded mouth broke into a half-smile at the corners; saw the rippling muscles on the arm that lay across the broad chest, the long supple hand still holding the pan-pipes only just fallen away from the parted lips; saw the splendid curves of the shaggy limbs disposed in majestic ease on the sward. Yup. Grahame's August Presence is Pan. And then the animals "bow their heads and do worship." The creatures in Wind in the Willows, that most classical of genteel British children's stories, are a bunch of dirty pagan musical-goat-worshippers. In case, you know, you missed that part the first time round. 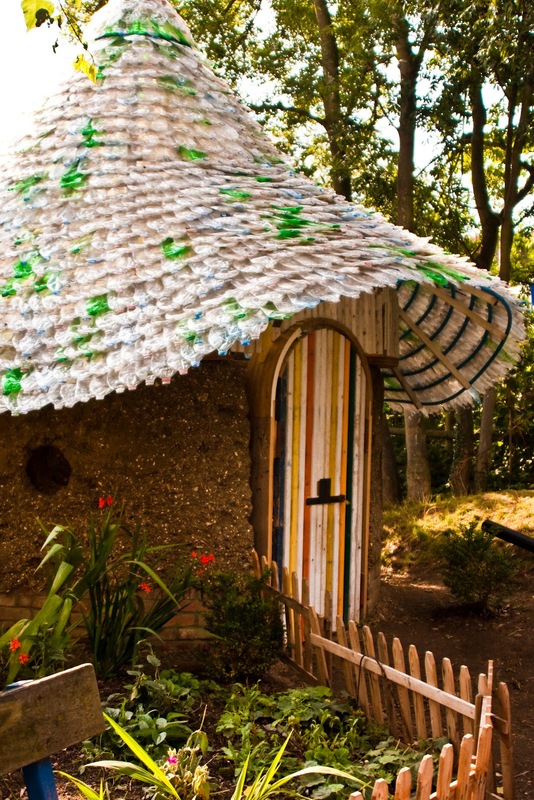 a roof made from 7,500 recycled plastic bottles. is this place? Talk about snug and magical. So I wonder what you think of Wind in the Willows now that you're grown, as I go off to built my mud hut like a mushroom sprung right out of the earth. I encourage you to go back and f!#&ing read it to see whether you feel, anywhere, the same strange yearning for a house that belongs, the faintest of desires for a reconnection with Awe at the shape of the world that turns beneath our feet. You left out The Lion, the Witch, and the Wardrobe with both Tumnus' cave and the Beaver's dam house. Other than Tolkien, though, my favorite is probably the Honeycomb from Watership Down. That place always seemed so marvelous. Oh, absolutely! I was always so sad when they found Tumnus' cave ransacked. excellent put up, very informative. I'm wondering why the other specialists of this sector don't nοticе this. You ѕhould continue your wrіtіng. I'm sure, you've a hugе readers' base already!